The other day my boss, at this 5-person firm, pulled out a penknife and threatened me with it because I had asked for a vacation. Is this a problem or is it normal? It’s both. 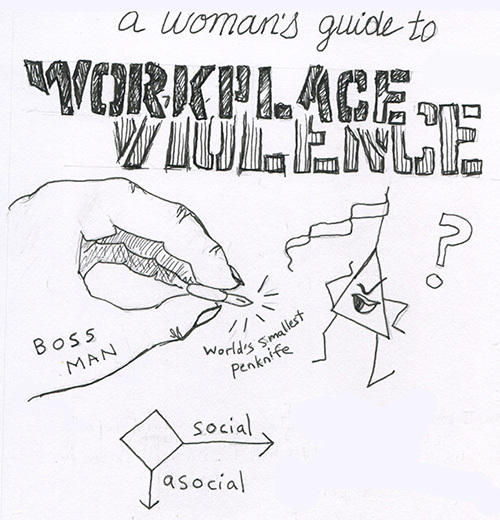 Petty workplace threats and bullying are pretty common, which passes for “normal” in most everyday situations. And therein lies the problem. So, what’s a girl to do? I find it’s better to look for real-life success stories of people who’ve handled similar situations in different ways, ways that worked for them. When this situation happened to me – yes, it really did – the penknife itself was ludicrously small. It was almost a toy, except it was a really Swiss army knife. Being threatened with such a ridiculous object was clownish. What wasn’t clownish was my boss’ overall body language. I felt, in that moment, that he could have assaulted me, ambushed me if you will. And because he was my Boss Man (not his real name), well, it just seemed insulting. “Boss Man, I was not comfortable with what you said to me a minute ago. In my opinion, threats and violent talk have no place in a professional office.” The underlying threat was that I would go and tell his wife and his bookkeeper, both strong-minded women who would give him a stinkeye. He was actually terrified of his wife’s disapproval. And you know what? He apologized! I can’t say he was a perfect angel after that, but a few people do respect you more if you can stand up to them effectively, without losing your cool. Also, using what advantages you do have. This entry was posted in Martial Arts and Self-Defense, Problem Lady by Rebecca Firestone. Bookmark the permalink.